Ground was broken Tuesday for the new medical facility in Alamo. Construction began Tuesday at the site where Alamo’s first standalone emergency room will open this year. The emergency room, a part of South Texas Health System, which already operates three standalone emergency centers in Hidalgo County, will likely open in fall 2018. The center to be located at 140 E. Frontage Road in Alamo will be open 24 hours a day year-round, and be supplied with identical diagnostic technology used in the hospital’s emergency rooms. “ South Texas Health System is striving to bring medical care, and more importantly emergency medical services even closer to residents because every second counts when it comes to saving a life,” Marcy Martinez, a spokeswoman with South Texas Health System, said. The $10 million emergency room in Alamo will include nine rooms for treatment as well as a pediatric room and triage area. 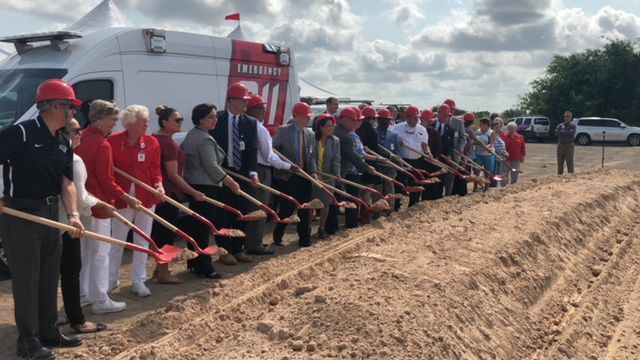 Mayor Diana Martinez, Alamo Economic Development Corporation members, City Manager Luciano Ozuña Jr. and other local leaders joined South Texas Health System representatives for the groundbreaking held Tuesday morning. South Texas Health System opened freestanding emergency rooms in Weslaco, Mission and Edinburg and is constructing additional centers in McAllen and another in Edinburg on McColl Road. South Texas Health System operates Edinburg Regional Medical Center, McAllen Medical Center, Edinburg Children’s Hospital, McAllen Heart Hospital and a handful of other medical facilities in Hidalgo County.